This dilemma is so simple, that there is very little to write about it. It costs four and consumes two dilemmas when revealed. You place it on an opponent’s mission and get to replace all attributes in the mission requirements and alternate requirements with the named attribute of your choice. 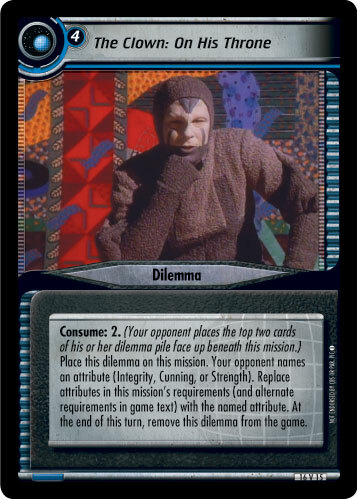 At the end of the turn, the dilemma is then removed from the game. There, I said it was simple. I could tell you how naming Integrity will affect the Borg, Cardassians, Ferengi, Maquis and Romulans. I could tell you how naming Cunning will affect the Bajorans, Dominion and Klingons. I could tell you how naming Strength will affect any Federation deck. I could also tell you that, with minimal tracking of personnel attributes, this one dilemma could be enough to stop a mission attempt by itself. I could go on to mention ways to reduce the consume, and ways to make sure you draw this dilemma when needed. I could also tell you how to make sure your opponent's personnel can’t increase their attributes. But, I’m not going to do any of that. Go away, I want to be left alone.